Most popcorn ceilings installed in a lot of homes are dated back to the early 60s up to the late 70s. It was around these years when home ceilings were given acoustic treatment to cover up poorly installed or damaged drywalls. Popcorn ceiling was also called acoustic ceiling because it had the capability to lessen echoes within a large home. However, acoustic treatment was banned when it was discovered that it contains asbestos and lead, two deadly chemicals. Jacksonville, FL popcorn ceiling removal in many homes followed through after this discovery. If you are living in an old house, or just recently bought one that has a popcorn ceiling, you might consider having the ceiling removed immediately. You might wonder why there are still old homes with popcorn ceilings around. It is because, popcorn ceiling removal in Jacksonville, FL is quite expensive. Home Value – Popcorn ceilings can decrease the value of your home. Houses with popcorn ceilings have very few potential buyers. 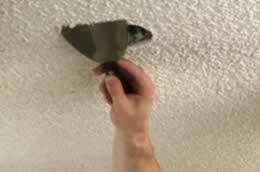 If you want to avoid this, make sure that you get a Jacksonville, FL popcorn ceiling removal service. Health and Safety – If your popcorn ceiling tested positive for asbestos, you and your family’s health is in great danger. A professional popcorn ceiling removal in Jacksonville, FL will eliminate this danger.